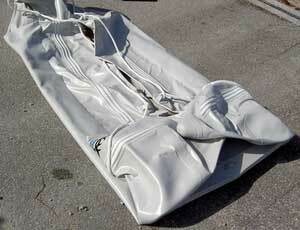 How to properly deflate and fold Saturn inflatable boat. Your boat has several separate air chambers and valves. First of all open all of valves by depressing them and turning a quarter turn. 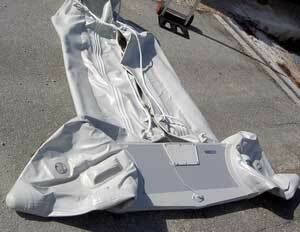 Use a vacuum cleaner or a 12-volt electric pump to deflate the inflatable keel. Close the valve and install the valve protector cap. 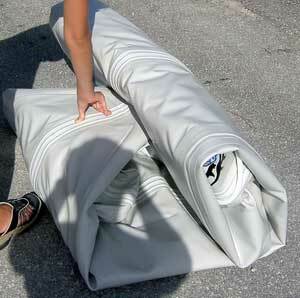 If your boat is equipped with an Plywood or Aluminum Floor, it is now time to remove it. Remove the stringers from either edge first. Now, lift the floor about 10 inches at the rear most seam (between the last and second last floor pieces). Carefully lift the pieces out and place them in their carrying case. If your boat is equipped with a High Pressure Air deck Floor, remove the air from it and install the valve protector cap. It is not necessary to remove the floor from the boat unless you wish to clean the boat at this time. The valves should be in their "open" position for disassembly. They are open when they are in the down position. They can be alternately placed in their up (closed) and down (open) positions by pushing them down and turning one quarter turn. 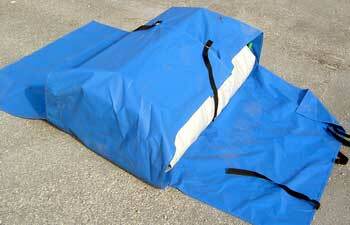 Make sure that each chamber in your boat has a very small amount of air in it to prevent severe scrunching of the fabric so that damage doesn't occur while your boat is being stored. Next, deflate the front section of the boat. As it is deflating pull up on the bow ropes. This will make it easier to fold later. Close the valve. 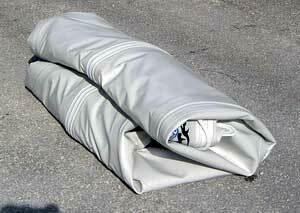 Deflate the main pontoons. As they are deflating pull up on the side ropes so that the boat will fold in properly. You want the pontoons to fold in so the entire package is not wider than the transom. 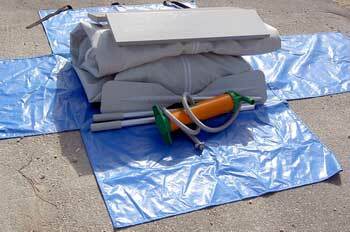 If the pontoons are not folding in properly then put a bit of air back into them and repeat the deflation procedure until you achieve the desired result. Fold the pontoons in so that they are laying flat and are no wider that the transom. Begin rolling up the boat from the transom. Fold the nose of the boat in. Finish rolling up the boat. 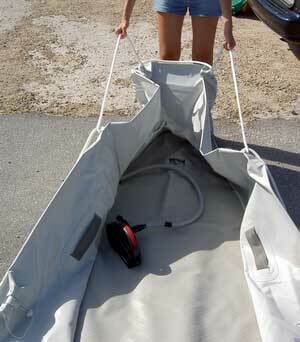 Place folded boat and accessories over carry bag. 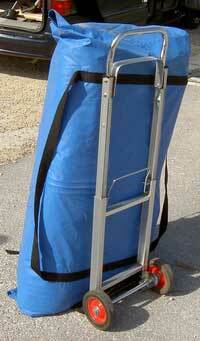 Fold and faster narrow flaps of the carry bag. 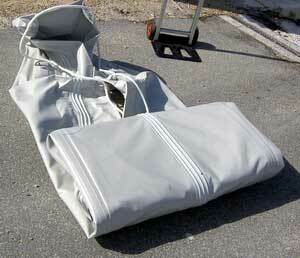 Fold and fasten wide flaps of the carry bag. 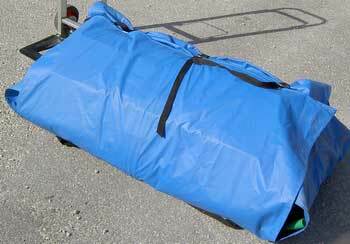 Now boat compactly folded into carry bag and ready to be stowed away.